One of the best things about winter, from a gardener’s point of view, is the opportunity it offers to plan for the year to come. Temporarily freed from the constraints of regular watering, weeding and dead-heading, you can enjoy having time to take stock. And as the annuals have died away and herbaceous perennials are receding, you can critically assess the garden with fewer distractions. 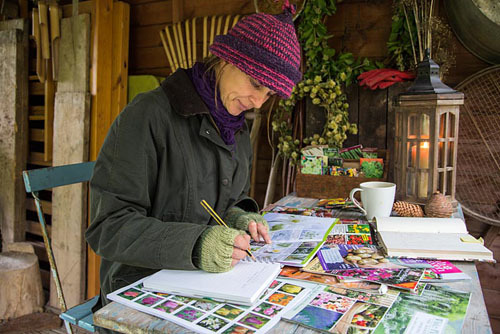 Wrap up warm, grab a mug of tea and walk around your plot taking note of what has done well for you this year and which areas of the garden could be improved. 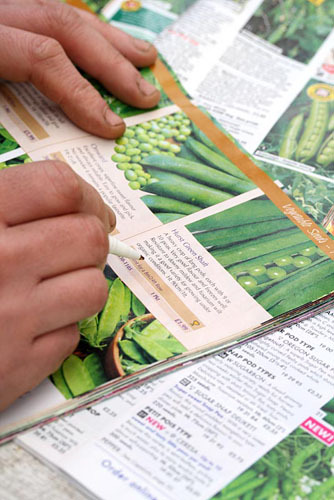 Then you can sit down with all the latest catalogues and your favourite gardening books and start to get organised. Plant breeders work incredibly hard to find new varieties every year that offer breakthroughs in terms of performance, whether it be long lasting flowers, exquisite scent, disease resistance or heavy crops. It is therefore incredibly tempting to trial a selection of the latest strains every year. But at the same time, it’s wise to order some of your old favourites. These could be heritage varieties, RHS Award of Garden Merit winners or F1 hybrids that have always brought you success. After all, you will know what works well in the unique conditions that your plot offers in terms of soil quality, sunshine and even the amount of free time you have available to dedicate to tending your plants. When it comes to planning your veg garden, it’s vital to be realistic about your lifestyle and the crops you and your family prefer to eat. After all, it’s pointless choosing an extra-heavy cropping courgette if you couldn’t keep up with last year’s harvests and ended up giving most of them away. Similarly, there’s little sense in trying unusual crops such as asparagus peas and Chinese artichokes if you tend to find you’re too busy to devote the extra time they need when it comes to preparing them for the kitchen table. But if you love entertaining, and enjoy experimenting with new dishes, then you should devote a good portion of your garden to trialling something different. While striking the right balance between new discoveries, and tried and tested gems that you wouldn’t be without, it’s also important to plan at the outset how you can extend your growing season. Choosing early varieties of crops such as peas, beans and sweetcorn can mean you get a few extra weeks of that tantalising just-picked flavour. If you know that your family will always eat as many carrots as you can grow, then now is the time to plan ahead so you can be harvesting fresh roots from the end of May to the beginning of February. Successional sowing is also a key factor here, so you may want to create your own seed box which is divided into monthly sections. 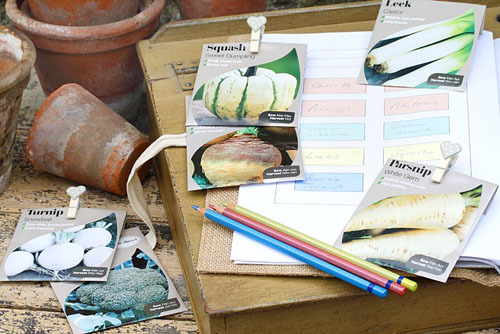 That way you can sow a part of your packet of seeds in April, more in May and the last in June. This will mean that you have far more months of picking tender young crops at their best. Most vegetables can be divided into main groups. The brassica family includes cabbage, kale and swede, while legumes include peas and broad beans. The onion family includes leeks, garlic and shallots while root vegetables are self explanatory. 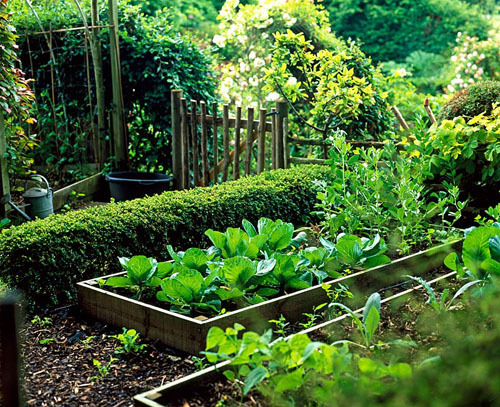 While planning what you’ll grow for the year ahead, it is also sensible to consider where you will plant them. It’s wise to rotate what family goes in each bed, as this helps you to avoid depleting the nutrients in the soil. It also helps to avoid a build up of pests or diseases. Don’t forget to order plenty of seeds of ‘filler’ crops such as rocket, spring onions and radishes, so that you can plant a row of these quick-growing goodies whenever you find there is a little space free in your vegetable beds. This entry was posted in Expert advice on December 23, 2013 by gapadmin. The temporal nature of our plants and gardens is something quite fascinating. A young, almost hopelessy fragile seedling grows so quickly into ostentatious maturity, before diminishing again as the season grows old. Though the flowers fade, there is still beauty to be found in the architectural, almost insectoid seedheads that remain through autumn and winter. 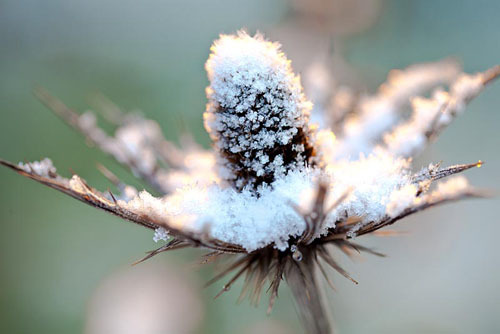 This last hurrah is beautifully captured in the image above – the husk stands as a memorial to the once vibrant blue flower of the sea holly, now frozen literally and figuratively by the oncoming winter. The soft greens and blues of the background colour seem to capture the brittle crispness of a winter morning, with perhaps just the faintest promise of new spring life. Gardeners aren’t the only creatures who find value in seedheads; they are a great source of food for our native birds, and of shelter for insects and other invertebrates. This means they bring interest to the garden even after they are finally cut down, as they support many kinds of wildlife through the harshest part of the year. So remember not to go too far when tidying your garden at the end of the growing season; there are still wonders to come. This entry was posted in Seasonal, Winter on December 20, 2013 by gapadmin. 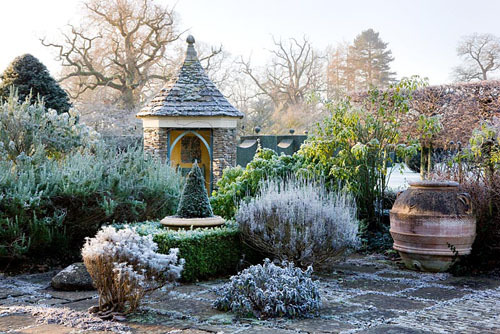 If ever a picture spoke of the fairytale magic of a winter garden, this has to be it. It features a corner of the Terrace Garden, which was one of the first parts of Highgrove to be laid out by Prince Charles. His intention was to create a sheltered area close to the main house where he could enjoy his favourite scented shrubs and perennials. What this photo so enticingly illustrates is that the plants, and the design as a whole, have an entirely different allure in winter. Dusted with frost and caught in the low-angled sunlight, the elegant but relaxed planting shows how a garden can excel in every season. The image shows an interesting mixture of classical elements (topiary, geometry, box hedging) balanced with an informal, almost whimsical arrangement that adds to the sense of wonder. We can also appreciate the contribution made by evergreen planting to the winter scene; how wonderful it looks framed by ice-touched paving against a background of skeletal oaks. Apart from the paving itself, other hard landscaping and ornamentation also come into their own; the visual impact of the giant urn and the ‘pepper pot’ pavilion balancing each other nicely. This entry was posted in My favourite, Winter on December 19, 2013 by gapadmin.